The third is by far my favorite – love chambray. Wonderful post (lots of outfit inspiration)! Dying for all of that Tory Burch! 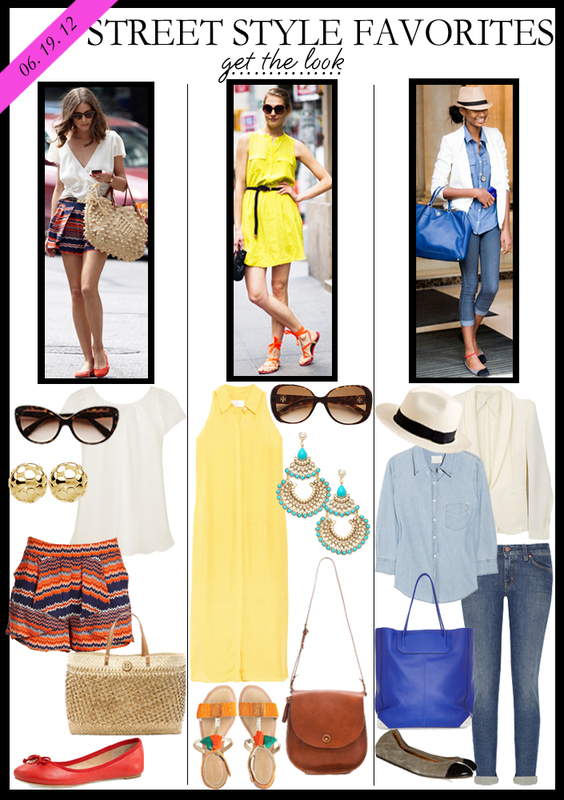 the last outfit is so perfect for a casual,but sophist acted look! I need that tory burch straw tote! Love how you recreated these looks! Those Parker shorts are my favorite! i LOVE the gold studs! I need them all! Olivia always rocks it! I love the first (I love Olivia! ), and the third. Oh, and while I am at it, the second one is perfect, too. And I think you did an awesome job figuring out individual pieces to recreate the outfits!! your collages just get better and better! my favorite look is the middle one. simple, comfy, chic! Obsessed with the shorts… and everything else that you posted! All such great city summer looks! Love all of those, but especially Olivia's outfit…she always looks perfectly put together! I love these posts you do! Those Calypso sandals are somethin' ELSE! Those Parker shorts are fabulous and they are (of course) already sold out ay Nordstroms – they are so adorable! Love you other outfits as well. Thanks for sharing! Dying over the first outfit! Need the shorts and earrings!